Tanzania's Ngorongoro Crater and surrounding highlands together form one of Africa's most beautiful regions. Volcanic craters form stunning backdrops to some of the most fertile and richest grazing grounds in Africa. 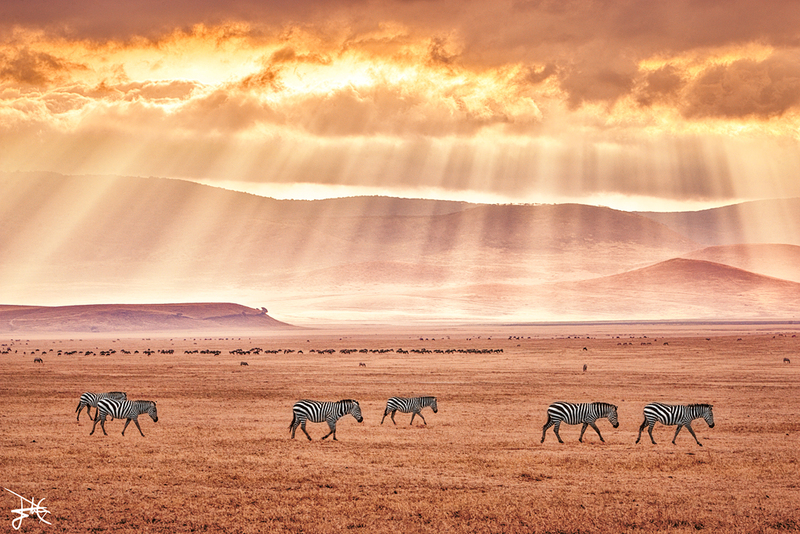 The most famous of these without question, is Ngorongoro, the world's largest intact volcanic caldera, and home to the highest density of big game in Africa. Ngorongoro forms the centerpiece of the Ngorongoro Conservation Area, a UNESCO World Heritage Site located 180 km west of Arusha in the Crater Highlands area of Tanzania. Formed when a large volcano exploded and collapsed on itself two to three million years ago, the crater is 610m deep with a floor covering almost 260 square kilometres, and home to a huge diversity of animals. Boasting an extraordinary population of predators, it is also one of the best places in Tanzania to see 'The Big Five'. A healthy population of black rhino and some of the largest tusker elephants left in Africa today are prize sights, but the crater is also home to good populations of lion, leopard and hyena, along with healthy herds of wildebeest, buffalo and zebra. Other wildlife here includes serval cat, cheetah, jackal, Grant's and Thompson's gazelle, flamingo and bat-eared foxes, as well as approximately 400 species of bird. Since the wildlife mainly stays in the crater all year round, there is really bad time to visit. However, given that the crater floor does get busy with vehicles, it can be more pleasant to visit during low season, when higher water levels in Lake Magadi (in the centre of the Crater) also result in higher concentrations of flamingos. But whenever you visit to Ngorongoro, you are guaranteed excellent safari action.